It happened last week, on the hottest day of the summer (so far). I was parched. Heated. In need of a beverage in the worst of ways. And in an act of misguided desperation, I reached for my colleagues glass of (in my defense, shimmering and delicious-looking) iced tea, downed it, and reflected on my good decision-making skills. When my colleague asked me if I knew I'd just drank a hard iced tea, all I could do is gawk back in awe. What I just drank was refreshing. It was delicious. And -- perhaps most importantly -- it contained sweet, sweet alcohol. A triple whammy. At this point, the wonders of alcoholic tea consumed me. I had to try as many as I could, and I soon realized the hard tea market is currently booming. In fact, there are so many great, hard teas right now, it can be difficult to suss out the stars from the duds. So here are my findings: the six best hard iced teas you'd be a damn fool not to drink this summer. They won me over, in spite of me. And I'll bet my last lemon wedge they'll win you over, too. 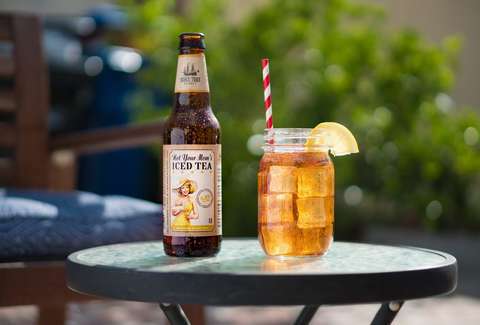 Continuing in the tradition of Best Damn Root Beer, Best Damn Hard Tea takes a drink you know and love, infuses it with alcohol, and threatens you with a very good time. Best Damn actually has three varietals of boozy tea drinks in their roster: peach tea, sweet tea, and regular. But why choose? All three will come in handy when you want a glass full of alcohol, but you don't want people to know you have a class full of alcohol. Add a lemon (or a peach! ), put on some Allman Brothers, and embrace the summertime drinking nirvana you've just stumbled into. So -- even though I'm not really into it, full disclosure -- green tea is supposed to be a drink that overfloweth with health benefits. And, since alcohol is (well... maybe) supposed to have health benefits in itself, an alcoholic green tea must be a panacea sent from the gods to cure all our worldly ailments, right? Well, if not, this stylishly packaged Vrai green tea is actually delicious, so it doesn't really matter. The surprisingly complex-tasting Vrai touts itself "sort of earthy, sort of fruity, totally portable," and for once, marketing copy actually nails it. Not only is this hard green tea one of the best hard teas on the market, it's one of the better "cocktails-in-a-can" you can buy, period. Switching gears a little bit, Noveltea positions itself more as a spirit than a beer substitute -- and though the name may suggest a sense of temporary importance, the drink itself is worthy enough to stick around for good (in my opinion, at least). The Great Britain-based beverage comes in both a "Taste of Tangier" flavor (basically, a Moroccan green mint tea mixed with rum) and "Earl Grey" (classic Earl Grey tea mixed with gin) varieties; and don't worry about embracing your inner snobby British mixologist -- this stuff can be served straight-up. Why end your afternoon tea time session with a quick drink, when your entire afternoon tea session can be a quick drink? It's hard to say anything about professional golfer, proud fat guy, and Rob Ford doppelganger John Daly that isn't instantly summed up in this video. Naturally, Daly creating his own alcoholic Arnold Palmer makes perfect sense... as Daly is basically an alcoholic Arnold Palmer himself. Available in "regular with lemon" and "half and half" (half lemonade, half iced tea... all booze, obviously), with expertly branded packaging featuring Goofy Golfer Plaid, the instructions to consume Daly's first foray into alcohol are built right into the name: you grip it, then you sip it. It's like the liquid embodiment of John Daly's entire career, in the comfort of your own palm. And this Smalltown Brewery Product (the same brewery that brought you Not Your Father's Root Beer, naturally) was the hard tea that started it all. And it's true: it really does taste like a slightly more bitter version of the (non-alcoholic) classic. It's the ideal, refreshing replacement for anyone looking to swap out beer at their next outdoor BBQ -- or actually, anywhere really. And invite your Mom, too! It may say "Not Your Mom's" on the label, but there's no reason to exclude her from the fun. After all, she did bring you into this world.